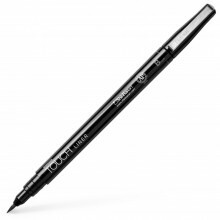 Sakura Pigma Micron pens are both acid-free and archival, giving the artworks created with them with lasting quality. These pens are ideal for any application requiring precision and permanance, such as papercrafts, journals, illustration, crafts. Even through the thinnest paper Pigma ink will not feather or bleed. Pigma ink is derived from a single pigment to ensure color consistency, and is fadeproof against sunlight or UV light. Pigma inks will not clog or dry out like most mechanical pens. Please note that Sakura Pigma Micron pens are not refillable.